do you ever have those times while reading the bible that you rediscover, or seemingly discover for the first time, a passage that you may have read 100 times, but for some reason this time it jumps out and grabs you?! i just had one of those moments and i want to share with you all. last night was my wonderful husband's birthday and we celebrated with cramming 50 friends and family (includes the children) into our little 1100 square foot house for dessert and fellowship. we took a time to pray over my husband and bless his upcoming year. this morning, while i was reading the bible, i found what would have been the perfect blessing to pray over him for this year in psalm 20. it is a psalm of david, but it reminded me so much of the irish blessings that are on greeting cards. it is perfect to pray over a friend who is celebrating a birthday and entering a new year or season, and completely a scriptural way to prophesy over his/her life. may He grant you your heart's desire and fulfill all your counsel! save, O LORD; may the King answer us in the day we call. so take the as a blessing for you day. be blessed! i have a prayer list of people that i try to pray for semi-regularly. sometimes i get stuck in what to pray for them. of course i want them to be generally blessed and have health and provision, but beyond the generic it is often difficult to go deep in prayer for someone and be confident that my prayers are biblical. i have found that using the prayers that the apostle paul prayed in the different letters he wrote to churches in the new testament is a great starting place to launch me into plenty of material to pray for someone on my prayer list. one particular prayer i like to use as a starting place is ephesians 3:14-21. i will break down how i have found useful to use it, so if you want to take some of these points or even pray word for word through what he prayed for the church of ephesis, you will have confidence in asking the Father. 1. i pray to the Father. i read an article written by john piper that pointed out how most prayers in the Bible are addressed to Father God, even prayers by Jesus Himself and his apostles after His death and resurrection. Jesus even instructed His disciples that they should pray in this way, "our Father who is in heaven..." i realized after reading piper's article that i usually had addressed Jesus first in prayer. i am not saying that we shouldn't pray to Jesus or the Holy Spirit, but in studying prayer in the bible and Jesus' own instruction on prayer i have shifted my focus to asking the Father just as Jesus asked the Father. Jesus even said, if you ask the Father for anything in My name, He will give it to you. (john 16:23) i do ask in the name of Jesus, but most often now address the Father directly in my prayers. 2. i ask that his/her spirit man would be strengthened by the Holy Spirit's power. 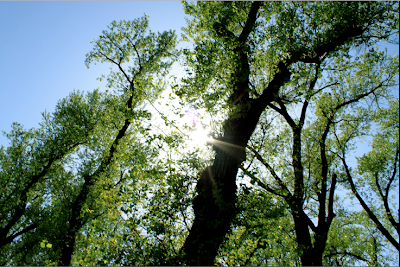 how many times in our lives do we struggle with discouragement? 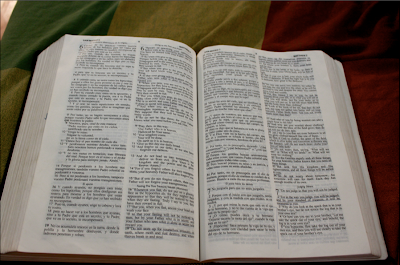 even king david wrote many times in the psalms, why are you downcast, oh my soul? put your hope in God! it is part of our frail humanity to go through times of being extremely aware of our own brokenness and weakness. this is not contrary to the goal of the gospel: in fact, when i am weak, He is made strong in me. (2 corinthians 12:10) it is always appropriate to ask the Father to show His strength in a person and to build up his/her inner man or spirit. He is rich in glory. He is all powerful. He wants to turn to us and strengthen us in the midst of our weakness. 3. i ask that he/she would be grounded in love through Christ. all people seek for love. the only way we will ever know a love that satisfies or holds us steady in the midst of storms in life is through Jesus Christ. there is no other love that satisfies. i pray for my friend to know this love in a very experiential way that would cause his/her roots to go down deep in Jesus like the righteous man in psalms 1 or the wise man in matthew 7. we can know of Him with our minds, but until we experience His love for ourselves we will never grow deep and mature in love. i want this for every person i care about. 4. i ask for supernatural understanding of the vastness of Jesus' love for him/her. i ask that he/she would know all 4 dimensions of His love for him/her. it is a love that is beyond knowledge. we cease to be amazed by the new levels and dimensions of His love that still are unfolding to us. it is a love that is transforms us. it is the love we all desire. 5. i pray that he/she would be filled to the fullness of God. i ask that my friend would have a fresh encounter with God and a fresh infilling of the Holy Spirit. even though if we know Jesus, we have already had those life-changing encounters, we can always use more encounter with Him. can you imagine being completely full of Him? there is so much i haven't experienced yet in Him. there is so much i have yet to encounter, and i want this very thing for those i love the most as well. 6. i remind myself that He can do all i ask and praise Him. prayer is not a wish list. He said that if we ask, we will receive. He is not only willing to answer us when we come to Him, but He is able to do far more than we can even imagine or have the guts to ask of Him. this power He puts within us. that is so crazy! to realize His vast ability and His huge desire that we come ask causes praise and worship to spill out of our hearts. i want to consciously realize that He is more than able and praise Him because of who He is. so simple, right? i don't know anyone who wouldn't want these things prayed over them. pick a couple people that you pray for and try praying through this passage over them this week. the bible is such a great tool to use to strengthen and deepen our prayers. i have to give a plug for this amazing mug that i got for mother's day from my amazing husband and kids (mostly my husband though)! 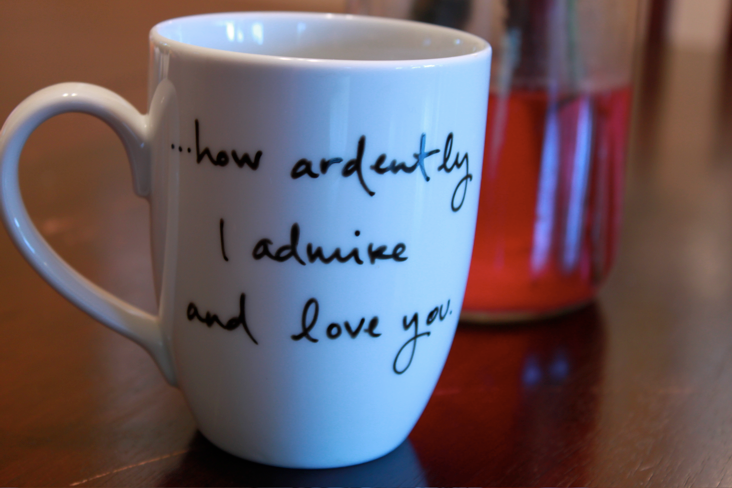 my good friend brooke at brookish.etsy.com makes all sorts of great treasures, but i have been eying her pride and prejudice mugs for a while. the problem was when i went to order one for a gift for someone for christmas, they were already sold out! what a good problem to have as a seller, right? she sells both on etsy and is now a wholesale distributor for different boutiques around the world (literally! ), so her work is very good and very desirable. 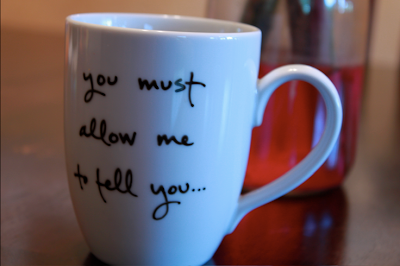 i have to say that drinking morning coffee or evening rooibos tea in this mug just makes me feel special all over. 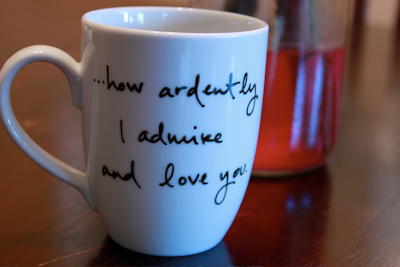 so silly, i know, but who can resist the famous quote from the proposal between mr. darcy and elizabeth? not me! i watched this movie over and over and over again as i knit christmas presents and was confined to my couch with intense all day pregnancy sickness during the winter. of all the scenes in the movie, that has to be my favorite of all. my husband did good when he picked this one out for me. so, take a second if you will to go check out her etsy site. i promise you will love what you find if you are anything like me. if you are not... still fun to go check out. she has a separate etsy site where she displays her amazing art work that has been featured in local art shows. check it out as well. then leave me a comment on what is your favorite find. i haven't been blogging for a while... i have been very busy with life but i haven't forgotten the blog world. i actually may be changing up my commenting again... just a thought swirling in my head that is actually hindered me from blogging because i wanted to decide what to do first. i just finally decided that i need to blog and then decide what to do later. more blogs coming soon!